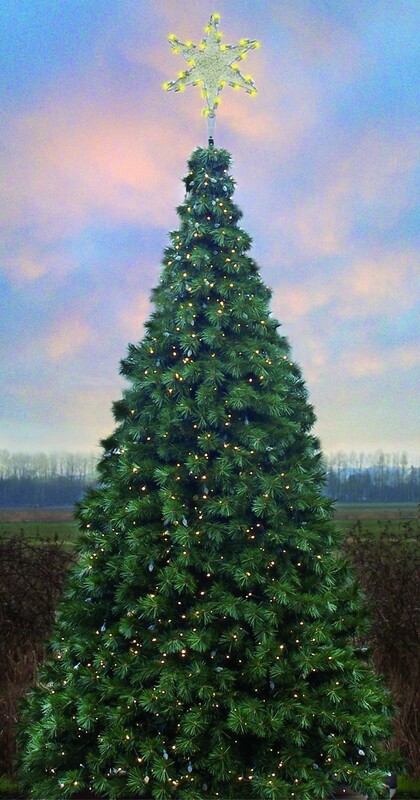 12' OREGON CASCADE FIR TREE IS MADE WITH 29 STRANDS OF WIDE-ANGLE LED MINI-LIGHTS. COMPLETE WITH STANDARD GROUND MOUNT HARDWARE. ALL OREGON CASCADE FIR TREES COME STANDARD WITH OUR 3-PLY DELUXE ROCKY MOUNTAIN PINE BRANCH GARLAND AND ONE STRAND OF 70 WIDE ANGLE LED MINI-LIGHTS PER BRANCH! SIZES ARE AVAILABLE IN 2' INCREMENTS FROM AS SMALL AS 6' TO GREATER THAN 70' IN HEIGHT.